Art & Faith Matters: Isaiah 11.1-10: How Peaceable? 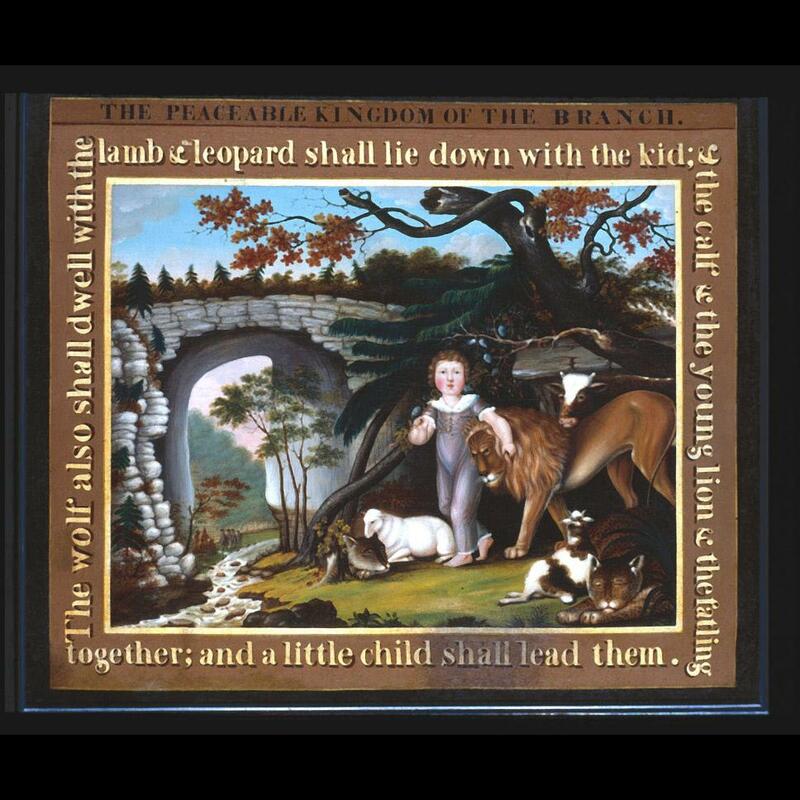 It's hard to resist Isaiah's "Peaceable Kingdom" (Isaiah 11:1-10) when it shows up in the lectionary readings for Advent 2A. It appears to have been reasonably easy for artists to resist that scene for centuries, though. There are pictures and sculptures of lions. There are pictures and sculptures of lambs. There are very few images of lions lying down with lambs. 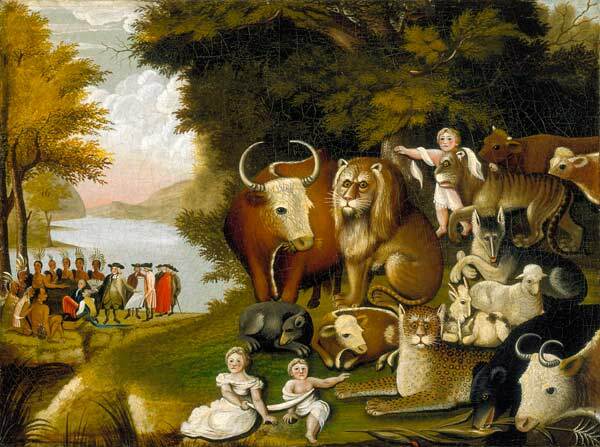 The frequency of depictions of what became known as "The Peaceable Kingdom" increases after the eighteenth century. The American artist most connected with the subject is a Quaker painter named Edward Hicks. Hicks painted the subject more than 60 times over the course of his artistic life. His original composition, painted around 1815 was based on an engraving by English artist Richard Westall. Over and over he painted the subject, perhaps in an effort to paint the peace into reality. Because in reality, Hicks was not living in a peaceable place at all. In his paintings, there are inclusions of and allusions to the non-peaceable world in which he lived. Hicks shows us how hard it is to conjure Isaiah's vision when we live in the world that we do. 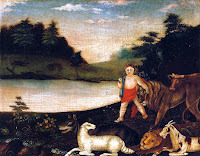 Hicks' earliest versions show a gentle child among animals that look like plush toys. We know that Isaiah includes predator and prey, eater and eaten, but in these earliest versions there seems to be more the sense of harmless animals than natural enemies who have decided to live together peaceably. These early images feature the young child who is leading them, carrying a length of grapevine on which hangs a cluster of grapes. The grapes should call to mind the promise of an abundant land. For what else would there be in the kingdom envisioned by Isaiah. 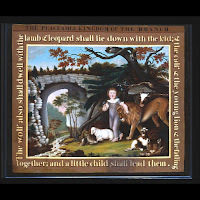 The second phase of Hicks' paintings draw a direct line between painting and scripture. Hicks' training was as a signmaker, so his inclusion of all or portions of Isaiah 11 are not unexpected. Not all versions with text have the same text, though originate in Isaiah. The versions with more text often use that additional text to explain the usual background scene. In that scene, Quaker William Penn makes a treaty with the Lenni Lenape (also known as the Delaware) people. This treaty, entered into in 1683, held until 1755. In the version shown here, the circle of treaty-makers is overshadowed by Virginia's Natural Bridge, which visually connects the two sides of the canvas. In the "middle" Kingdoms, the animals become more aggressive. The lion's and leopard's teeth are visible in a couple of versions, and the animals become more tense. Their eyes are wide open, and they stare unblinkingly (hostilely?) 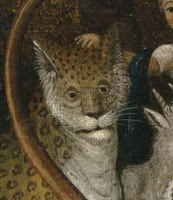 from the painting. This increase in tension may be a reflection of the divisions happening in the Quaker community. In 1827 there occurred the "Great Separation" where so-called "Hicksite" (because they followed Elias Hicks, a cousin of the painter Edward Hicks) Quakers, who chose to emphasize the Inward Light as a source of guidance for faith and conscience, separated from the so-called "Orthodox" Quakers, who emphasized a more Protestant reliance on Biblical authority. Originating in Philadelphia Yearly Meeting, this division became wider and spread, causing painful separations in other meetings and among families. These divisions were especially painful for Hicks, who in addition to being a sign and coach painter was also a minister in the Middletown (PA) Yearly Meeting. There are a number of Hicks paintings that include a gnarled, dead tree in the background as a further sign of Hicks' understanding of the split among Quakers. Compare the lion faces in the four versions shown here. Which lion goes with which painting? Can you put them in order? In the later Kingdoms the viewers' first impression of the animals is that they are neither plush nor attentive. They seem...tired. Dispirited, maybe. A career's worth of living on God's holy mountain seems to have taken a toll. 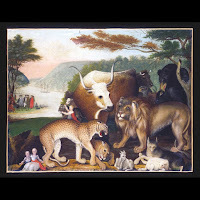 Or maybe it's the non-peaceable kingdom in which the artist is living that has taken a toll on the artist. Hicks helps us see the passage, but he was unable to live it in reality. We've not seen this come to pass either. But that doesn't mean it won't happen. The vision is memorable. The promise is certain. One day they will not hurt or destroy on all God's holy mountain. On a day that is still to come. All paintings by Edward Hicks. See what this leopard brings to the discussion. 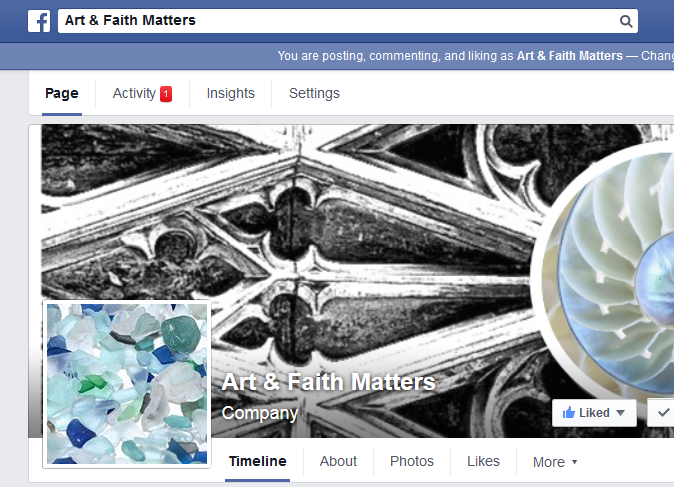 Click on the Art&Faith Matters Facebook link below.